We are excited to have Cathi O'Neill creating with us this month. Cathi is well known to all of us at C'est Magnifique and has been hanging around our forum for a long time. She is an awesome scrapper and we know you will fall in love our August kit when you see how she has used it. Her style has certainly developed over the past year and she is being recognized for it! We will let you get to know her a little better (if you don't already), and then we'll give you a chance to see her creativity as she shows you how she has used the August Kit. I am so excited to be guest designing this month for C'est Magnifique, I have been a long time subscriber and just love to see what Leslie has chosen every month!! My name is Cathi O'Neill, and I am an American (Maryland/DC area native) who married an Irishman and have been living here in Ireland since 1997. I live in a beautiful village on the Shannon River with my DH of nearly 18 years (wow, that makes me feel old!) and my two beautiful daughters, Aine (onya) 10 and Aisling (ashling) 8 who are the subject of many of my projects!! was born!! I truly love creating and make vintage cards to sell here in our local village cafe as well as stacks of shabby/vintage style layouts of my girls to keep and share with family! I also love to do tags, ATC and altered projects, barely a day goes by when I haven't done something crafty!! I am currently on the design teams for several manufacturers: Couture Creations, Molossi Chipboard, Paper Wings Productions, Tresors de Luxe Etsy Shop and Paper Temptress specialty cardstock store. I also design for challenge blogs Frosted Designs and Sugar Creek Hollow, and have guest designed for challenge blogs Keeping the Best and Scrap it with a Song. Take a look at how Cathi has used our August Kit, "A Day in the Park"
Cathi, thank you so much for joining us as our Guest Designer for August. We are all fans of the way you use our kits! Way to go, Cathi! beautiful projects. 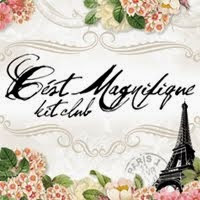 So happy to see your work with C'est Magnifique. Beautiful work there my friend!! And the cards are an extra treat!! Love them!! woohoo Cathi!! congrats!! beautiful LOs!! love them all!! So over the top gorgeous! Glad to see you here as GDT!